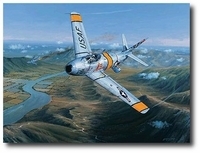 From 1954 to 1957, the Alaska Air Guard�s 144th Fighter Squadron flew F-86E Sabres from Elmendorf AFB and the new Anchorage International Airport. 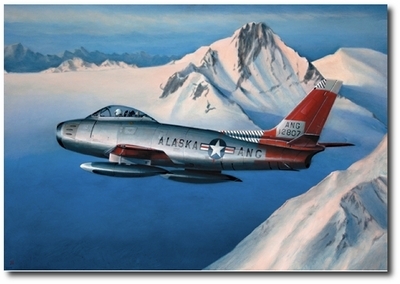 The squadron supplemented regular Air Force interceptor units protecting Alaska and the Lower 48 from Soviet bombers approaching from Siberia and the North Pole. The Sabre was best known for its exploits over �MiG Alley� during the Korean War, where it proved itself superior to the Soviet-built MiG-15.